Originally developed in 1919 by an SKF engineer, Arvid Palmgren, the spherical roller bearing (SRB) has since made its mark worldwide. Created to complement the self-aligning ball bearing, due to its ability to accommodate misalignment under heavy loads, the initial SKF design has now become part of the largest family of products in the industry. On the fabled Las Vegas Strip in the US, the High Roller ferris wheel contains two of the largest SRBs ever produced by SKF, each weighing in at 8.8 tonnes. SKF spherical roller bearings can be found in many applications, including some where you might not expect them. A good example is the Bahrain World Trade Center, where three tower wind turbines, each 29 meters in diameter, are architecturally installed between the two 240-meter-high (50-storey) towers and generate 1,300 MWh per year. The main shafts of the turbines were equipped with SKF spherical roller bearings. The turbines went online in March 2008 and are operational 50 percent of the time, depending on wind conditions. Another alluring application fitted with SRBs is the rebirth of the Zeppelin after 60 years of absence following the Hindenburg disaster. SKF was brought in by ZF, the gearbox manufacturer for the Zeppelin NT, to help the new and improved airships to propel forward. SKF's extensive SRB range delivers a range of benefits for specific operating conditions. 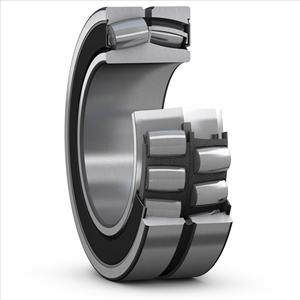 For example, operators in contaminated environments in heavy industrial applications have increased their bearing rating life by up to four times with sealed SKF spherical roller bearings. Those working in the harshest of environments have benefited from SKF's Three-Barrier Solution that delivers cost-effective, optimized rating life, minimal maintenance spherical roller bearings. New dimension gearbox design has even become possible thanks to SKF Explorer SRB's long service life and high performance.